Using the gate effect in Ableton Live, you can create interesting gated patterns to the beat by turning on sidechain, and selecting a rhythmic pattern to receive audio signal from. (note: If you select a midi drum rack, you can also select any one of the drums individually) Then all you have to do is play with the threshold, attack, decay and release to get the sound just right. Another great way to achieve complex evolving gated patterns is by adding automation to the clip itself. You can automate the volume of the clip or any other effect. Some people like to use the utility effect for this. You can make the automation however you want fairly easily, and if you switch linked to unlinked you can make automation patterns shorter or longer than the loop you’re using. This can come in extremely handy. 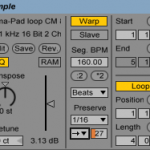 Using Ableton’s autopan effect, you can create cool chopped up rhythms in mono or stereo. You can even make several variations, put them inside an effect rack, distribute the ranges, and assign the chain selector to a macro. This allows you to automate between complex stutters very easily. You can create similar stutter edits by playing with the warp mode. Start by changing the warp mode to Beats, set the interval 1/16 and reduce the fade applied to each segment. Refer to the image on the left for a more visual example. You can cut the source sample up into multiple pieces and apply different preserve divisions. You can load the sample up in simpler, create a midi clip with whatever rhythm you desire, turn loop and length all the way down, turn fade all the way up, turn loop and snap on and automate the start point of the sound throughout the duration of the midi clip from inside the clip or in the arrangement view. You can download the Ableton 9 Live Pack of the project file I created for this tutorial to see examples of each one of these techniques in action. In order to download, you must share this post. The pad sound used in the project is by Auma from the Enigmatik Records sample pack 01. Have a different way of creating gated patterns? Please share your technique in the comments below. This tutorial was written by DJ Story aka Antandra.